An Adapter is a custom software component that is deployed on IoT Gateway devices executing the ClearBlade Edge. Each Adapter consists of a name, a small number of administrative commands, and a small number of files comprising the administrative and executable assets of an adapter. The files comprising an adapter will consist of executable code and supporting libraries as well as shell scripts used to administer adapters. To serve as a proxy between the ClearBlade platform and IoT devices that cannot directly communicate with the ClearBlade Platform. 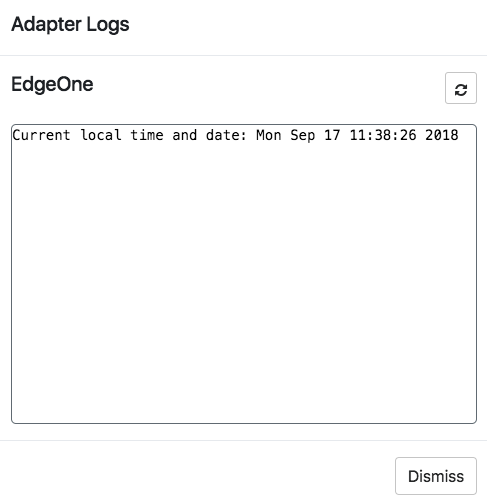 Once an adapter has been successfully deployed to an Edge, it can be started, stopped, or restarted using Edge Management portion of the adapter’s page, located within the ClearBlade Platform developers console. The status of the adapter on each edge is determined by the returned output of the status command from the adapter’s configuration, either “Running” or “Stopped”.If the adapter is not successfully deployed to an edge, the edge will be found in the Disconnected Edges table. Start-up Command - A command or shell script that will be executed to start the adapter on a ClearBlade Edge.If a start-up command is not specified , the adapter would need to be manually started by connecting to the gateway device (via ssh) and issuing an appropriate start.An adapter can be started on one or multiple edges from the Stopped tab of the Edge Management table. Stop Command - A command or shell script that will be run to stop the adapter on a ClearBlade Edge.The stop command is an optional command.If the Stop Command is not specified, the adapter would need to be manually stopped by connecting to the gateway device (via ssh) and issuing an appropriate stop command.An adapter can be stopped or restarted on one or multiple edges from the Running tab of the Edge Management table. # If this script is executed, we know the adapter has been deployed. No need to test for for the "undeployed" status. If a more sophisticated undeployment/deletion of the adapter is needed, undeploy logic can be incorporated into a shell script. In many cases, the Logs Command will be directly dependent on the Start-up Command piping output to a file, unless the adapter is written in such a manner that it creates its own log files. If more sophistication is needed to read log files, the logic can be incorporated into a shell script.